Artist impression of Sikun Labyrinthus region on Saturn's moon Titan. Are the features found on Saturn's moon Titan something other than they appear? The recently renamed Cassini-Solstice spacecraft has been analyzing information from the planet Saturn and its family of moons for almost seven years. Its primary mission target continues to be Titan, the largest moon in the Solar System and the only one with an atmosphere. Titan has puzzled planetary scientists for as long as Cassini has been sending data. For example, methane gas is constantly escaping from Titan because of its low gravity. Sunlight also causes the methane molecule to dissociate into its carbon and hydrogen constituents. Conventional theories state that Titan is billions of years old, so why does a dense atmosphere continue to exist? Cassini mission scientists believe that there are "oceans" of methane on the surface of Titan, replenished by a "drizzle" of liquid methane raining out of the atmosphere. 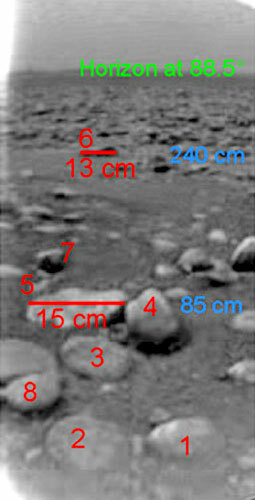 Images sent from the surface by the Huygens lander revealed a rocky landscape (below image) with the consistency of damp sand. Spectrographic analysis established that the "rocks" are made of water ice. It is easy to understand how ice can appear to be like rock when it is at a temperature of -179° Celsius. What Huygens did not detect was liquids of any kind. 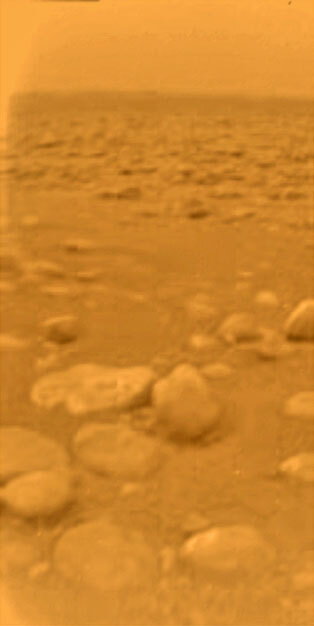 No methane droplets were falling from the clouds; there was no precipitation, and no pools of methane were visible within the lander's field of view. If there are no methane oceans to feed the atmosphere, how is it generated? Cassini team members speculated for some time that so-called "cryo-volcanoes" were keeping Titan's atmosphere replenished. 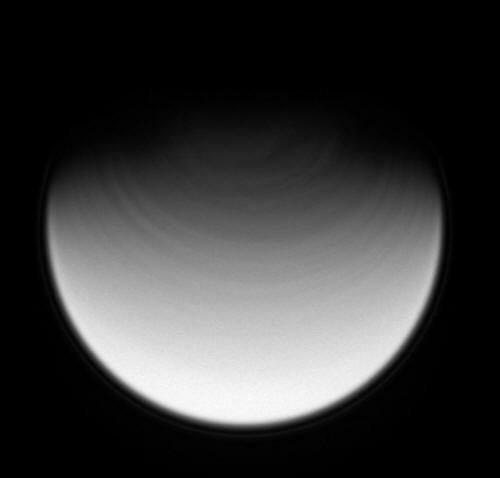 These supercooled eruptions were thought to bring the necessary gases out from the interior as Titan is heated up while being squeezed and twisted by Saturn's tidal forces. Recent data from Cassini has dispelled that notion, however. Titan retains its atmosphere because it is a relative newcomer to the Solar System born from Saturn in an electrical conflagration. Saturn contains a great deal of methane in its atmosphere, so if Titan came into existence just a few thousand years ago, it has not had time to lose what it was born with. A previous Picture of the Day noted that flowing methane (or ethane) has never been found on Titan and that the entire line of reasoning follows from an assumption without foundation. 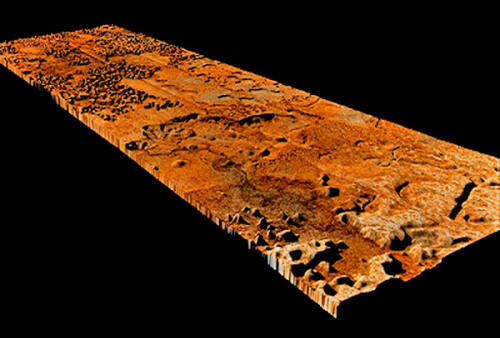 The so-called “river valleys” on Titan do not look as if they were carved-out by flowing liquids. Electric Universe advocates predicted that an examination of the images would reveal the "rilles" going uphill and downhill, rather than always downhill, as a moving stream would do. Rather, what we see on Titan are probably electric discharge effects. "Sinuous rilles" occur on most rocky planets and moons. Although they superficially resemble some river systems on Earth, there are no catchment areas or feeder streams and the tributaries are short, often meeting the main channel at right angles, a sign of electric arcs traveling through the terrain. Also, rather than ocean basins, the flat depressions on Titan could have been etched out by energetic plasma discharge events. Titan is an electrically charged body that is constantly bombarded by ion storms from Saturn. It has a particle fountain flowing out of its poles, as well as a torus of charged particles encircling it. The banding around its north pole (above image) indicates that streams of charged particles are circling Titan in the same way that electrons and positive ions circle Earth in opposite directions. In other words, there is a plasma ring surrounding Titan that influences its geology and its weather. Orbital images confirm that it has a dry surface where dunes several meters high march across the terrain in parallel rows. The so-called "dunes" are large, being visible from the Cassini orbiter thousands of kilometers away. They are quite distinct, with well-defined, almost solid-looking ripples and waves that pass over craters and around "yardangs." They appear to follow wind patterns, but they also have some characteristics (below image) that might mean they are not wind-generated in the conventional sense. Many of the dunes look like fingerprint patterns (below image), with whorls and arches. "Huygens' descent to Titan's surface was an acid test... In particular, the expectation of channels carved by cosmic lightning, similar to Venus, was confirmed. 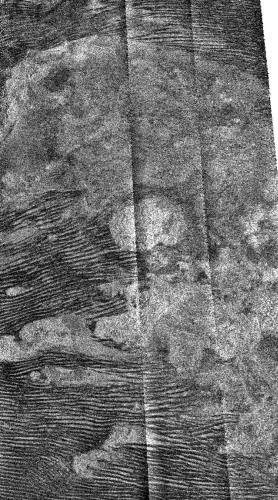 The channels on Titan bear the hallmarks of cosmic lightning imprinted on the surface. Also, the lack of a methane ocean was predicted because Titan's atmosphere is very young and a vast reservoir of the gas is not needed to make good the losses expected over the 4.7 billion years required by the solar nebula model. Titan is a Rosetta Stone for planetary history once the context is understood... Titan's surface - and the other bodies in the solar system - can be deciphered when it's realized they repeat what is 'said' in plasma discharges."